Posted on May 11, 2015 by staceyanderton1	in Entertainment, Features and tagged dancing, Panther Pawdcast, Prom. 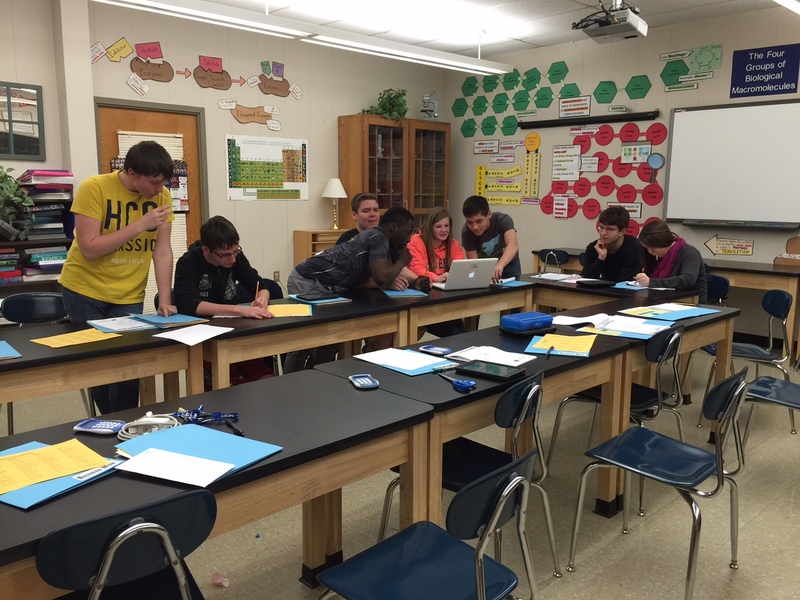 Posted on May 7, 2015 by staceyanderton1	in News and tagged Business Week, Sophomores. ACES (Americans for Competitive Enterprise System, Inc.) brings Pennsylvania Business Week, which was held April 27-May 1, to Saegertown High School in hope that sophomores can get a sense of real business situations. During the week, students are separated into companies and assigned a position such as CEO, marketing director, etc. Each company is assigned a product to “sell” to the public, and using the resources given, they must execute the design, development and marketing of the object. “I expected it to be boring, but it’s actually fun,” said sophomore Kendra Taylor. The trade show, held in the gym on Friday, gave students, teachers, and parents a chance to experience the hard work and experience the sales and marketing pitches of the six companies. 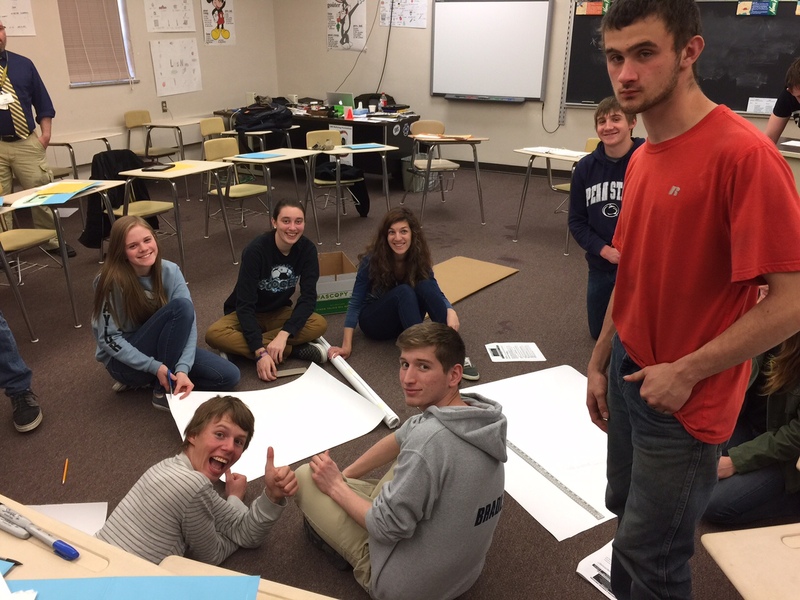 Mrs. Nicole Keller’s group of Kalib Kiser, Tanna Walters, Aidan Byham, Cutter’b Pritchard, Jude Mattocks, Jillian Rosipko, Kirsten Mowris, Marc Kightlinger, John Jackson, TJ Hasychak, Alandis Doctor, Rachel Barner, Tatin Bailey, Alexis Oldakowski, and Greg Gunn who produced the “Chronos” watch won the Top Company award at the awards ceremony Friday afternoon. Each team member received $100, t-shirts, coupons, water bottles, and other items. Other prizes were given to those for exceeding expectations in their group or performing well in competitions that featured their expertise. “It was very stressful; I think the fact that we all worked together well and didn’t have problems was the reason we won,” said CEO of Chronos Aidan Byham. For more information about PA Business Week, visit aceserie.org. Posted on May 7, 2015 by staceyanderton1	in Features and tagged EBooks, library, reading, SHS. Time to turn off those games you are vigorously playing on your iPad because there is now something worthwhile in town. Instead of rotting your brain with that riveting game of 1010, you can now grow your mind with the tiny tablet. The library is now offering electronic books, E-books. There are over 120 books in all genres from The Great Gatsby by F. Scott Fitzgerald to Mockingjay by Suzanne Collins. “I like the thought of having access to E-books, especially since the library is closed for business every other day,” said senior Eric Kisner. To start checking out books, go to Mrs. Litke with your iPad, and she will give you login information. Posted on May 7, 2015 by staceyanderton1	in Sports and tagged Saegertown Volleyball. 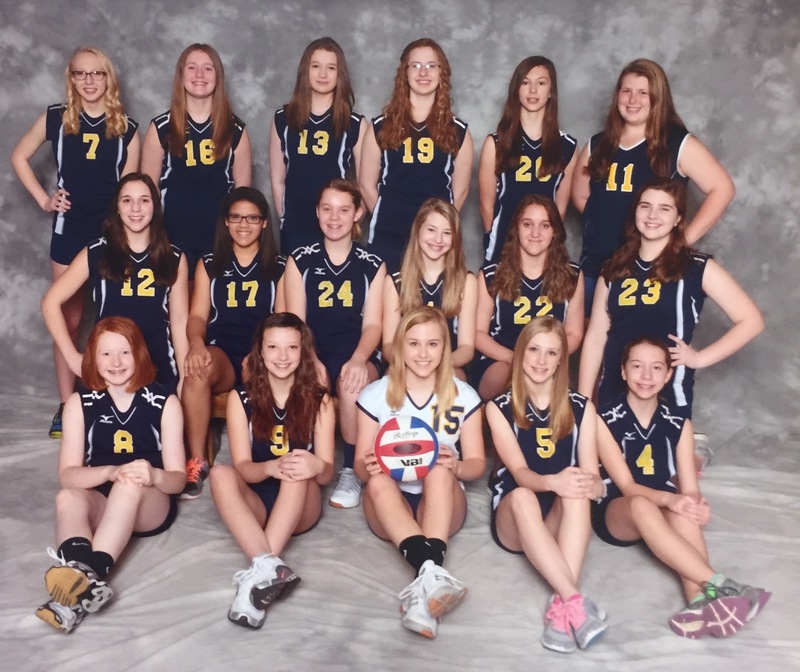 Saegertown sends congratulations to the junior high boys and girls volleyball teams for a great end to their seasons. The boys finished 1-4 while the girls finished the season 5-5. 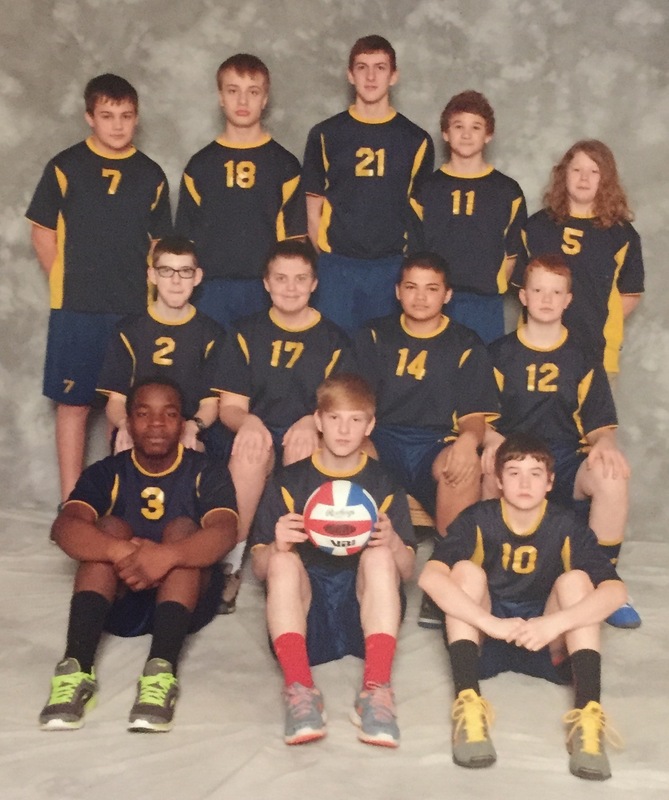 “Although we only won one tournament, we’ve improved a lot since last year, especially because we gained five new players just this year,” said eighth grader Will Phelan. The boys conquered their last tournament at Saegertown with a win. Several excited fans in the crowd were happy to see the boys win the nail-biting final match against Maplewood. Elizabeth Hasko and Carlie Schlosser of the girls junior high team said, “We’ve seen ourselves, as well as new members, improve. More volleys and discipline have been incorporated this year, which could be why we had more success.” The girls participated in two tournaments this season, and ended each in the final four group. Both teams are excited for what next year holds and will continue to work on new skills learned for the years to come. Posted on May 7, 2015 by staceyanderton1	in Sports and tagged USBC Youth Bowling. Saturday, May 9, three student bowlers from Saegertown High School will travel to Hanover, Pennsylvania to compete in the Pepsi State Finals, sponsored by Pennsylvania State USBC Youth Bowling. Nick Archacki, Michael Costello, and Kylee Higby will be competing against youth bowlers from across the state to determine a winner. The bowlers are split into categories determined by their age and gender. Nick and Michael will bowl in the Under 15 boys group, and Kylee will bowl in the Under 15 girls group. Each bowler will bowl a 3-game set with handicap added to finalize their score. After every bowler has bowled, results will be posted to decide a winner. “I’m pretty confident heading into this weekend. I feel like my game is strong, and I am going to score well,” said Archacki. To make it to the state finals, the bowlers must qualify at their home bowling house. All three participants from Saegertown bowled at Plaza Lanes in Meadville to qualify. Archacki said, “I can’t wait to get down there and start bowling.” For more information about the tournament and results, visit bowlpa.org. 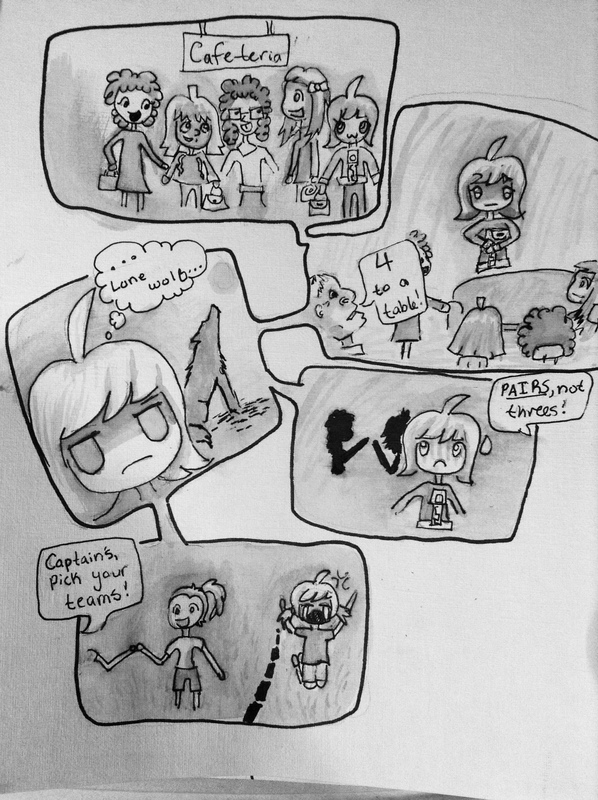 Posted on May 6, 2015 by staceyanderton1	in Entertainment and tagged comic, funny, so true. Posted on May 5, 2015 by staceyanderton1	in News. Members of the Hi-Q team. 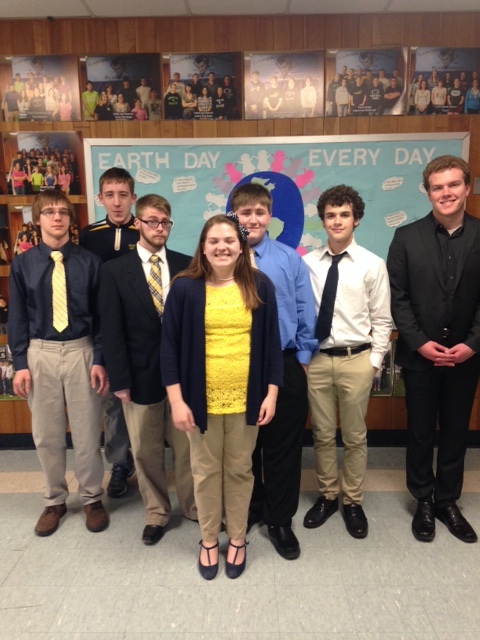 From left to right: Jared McClymonds, Tyler Brooks, Brennen Burke, Sydney Kightlinger, Dustin Bierman, Jared Shaffer, and Eric Kisner. The first PENNCREST Hi-Q was held in 1980, thirty-five years ago. On Wednesday April 29, the Saegertown Hi-Q team went head to head against Cambridge Springs and Maplewood in the annual contest, which consists of three fifteen-minute rounds of trivia. After the first round, Maplewood was in first place with 55 points, followed by Cambridge Springs with 45 points, and Saegertown was in last place with 30 points. At the end of the competition, Saegertown took second place with 195 points, only 15 points behind Maplewood. Cambridge Springs took last place with 95 points. “I think we did well. We performed well. I hope next year we can close that 15 point gap. I’m looking forward to that friendly competition,” said Saegertown’s team captain, sophomore Sydney Kightlinger. “We certainly made it interesting at the end. I am proud of the seniors, Eric Kisner and Brennen Burke. They have been wonderful competitors for several years, and they will be missed. This event is a grand tradition, and I hope the friendly rivalry continues for years to come,” said Hi-Q adviser Mrs. Stacey Hetrick. Posted on May 5, 2015 by staceyanderton1	in Features and tagged Art, Fred Corle. 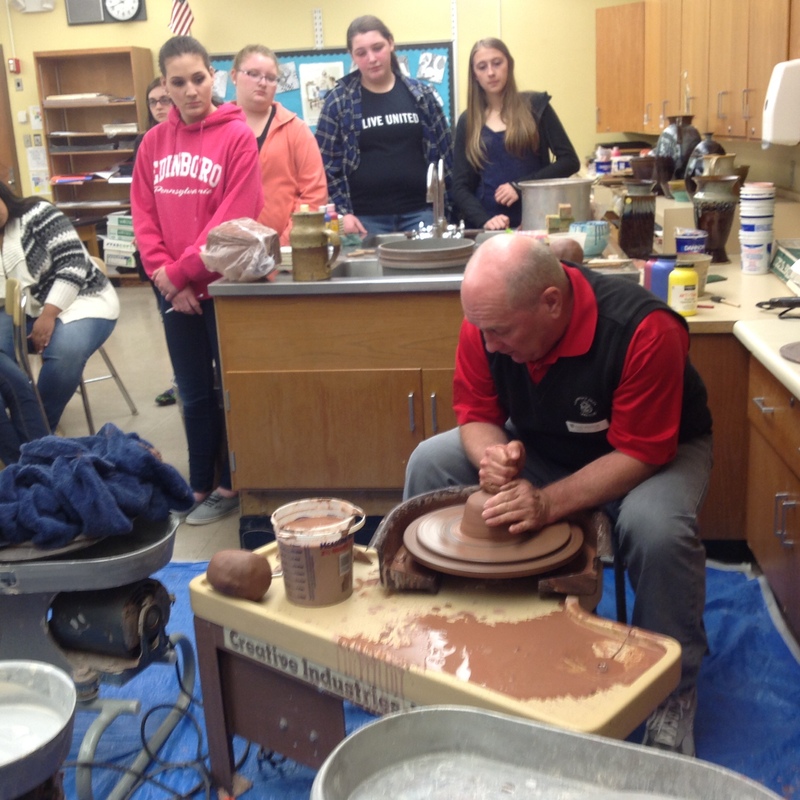 On April 28, retired Cambridge art teacher Fred Corle demonstrated ceramic techniques in Ms. Dani Hewston’s and Mrs. Heather Papinchak’s art classes. Students in art 1 – 4 were welcome attend, and the experience gave them some expert insight before they tried their own hands at the wheel. Now that he is retired, Corle now spends much of his free time exploring his talents at a local studio. He also occasionally places his pieces at art shows. 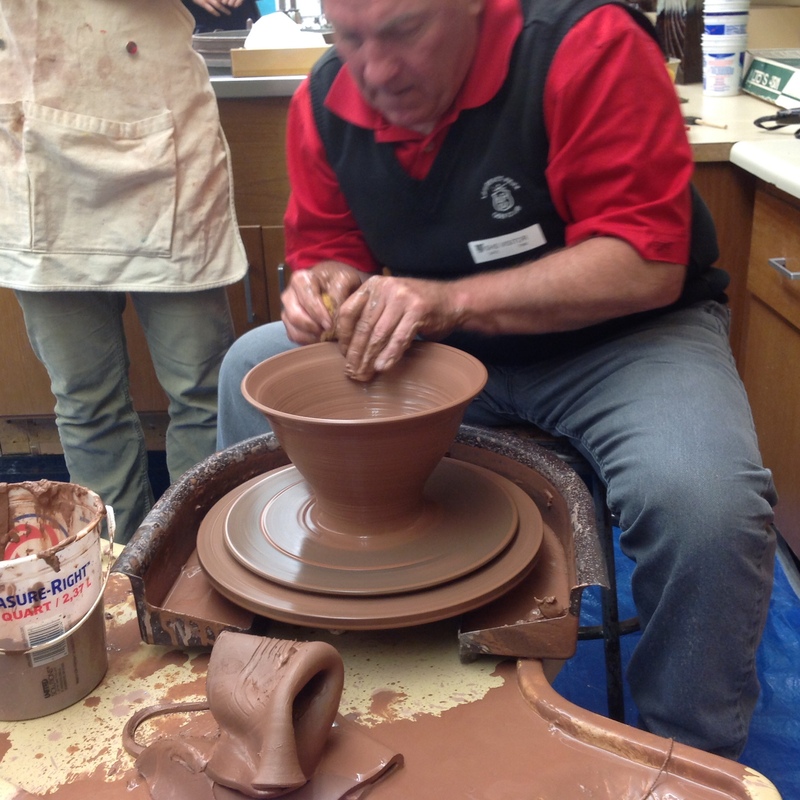 Being such an experienced potter and teacher, Corle almost effortlessly showed the art students the basic process of creating a small bowl or pot; from centering a crude ball of clay onto the wheel, to shaping the lump into a cylinder or a bowl. During the demonstration, he broke down the surprisingly complex process and explained the techniques he uses to steady his hands and gradually morph the clay into a piece of art, even slicing the finished product in half to show its thickness. Emily Morris, a current art 3 student, said, “Mr. Corle seemed to be very passionate about his work, and he explained it in a way was both interesting and easy to follow.” Overall, the students were both impressed with his skills and thoroughly enlightened about the process of ceramics. Posted on May 4, 2015 by staceyanderton1	in Media, News and tagged Mr. Greco's advanced biology class, PENNCREST Foundation, SHS Tree Planting. Check out the Slide Show from May 1 tree planting at Kinter Hill near Edinboro. Science teachers Mr. Chris Greco, Mr. Phil Young and Mr. Matt McLaughlin supervised around 30 juniors with the trees, which will provide funding for future scholarships from the PENNCREST Foundation.